‘Fire’ is no more. There was some will for it to become permanent. However, this was not to be. On reflection, mounting subwoofers on the underside of the office of the building’s namesake was unlikely to result in permanence. 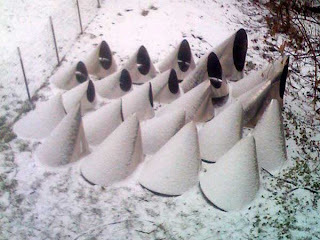 Karl has installed the ‘cones’ in his backyard. He’s calling this piece ‘Ice’.